2016 Colorado - When Does Texting - Calling - Become Harassment? 18-9-111 - Denver Criminal Attorney Specializing in Domestic Violence Cases - Colorado Criminal Defense Lawyer. 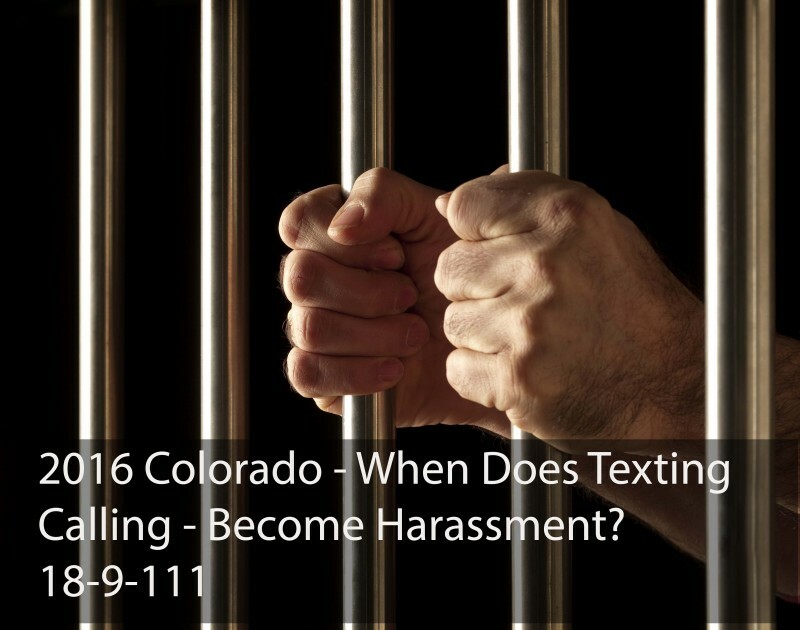 2016 Colorado – When Does Texting – Calling – Become Harassment? 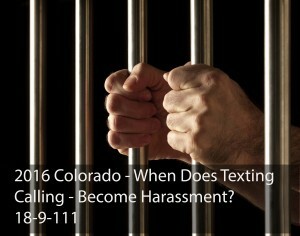 18-9-111 – Many of my clients are charged with Harassment under Section 18-9-111 of the Colorado Revised Statutes. There are several ways to be charged with harassment under this law and the law itself is amended often. This article, is an update and somewhat unlike others I have written. This article closely looks at the law as of 2016. The approach I take is to examine the language of the actual law itself. I encourage all to read the law and not rely on the words of others in other contexts. (1)(h) Repeatedly insults, taunts, challenges, OR makes communications in offensively coarse language to, another in a manner likely to provoke a violent or disorderly response. (7) Paragraph (e) of subsection (1) of this section shall be known and may be cited as “Kiana Arellano’s Law”. (8) This section is not intended to infringe upon any right guaranteed to any person by the first amendment to the United States constitution or to prevent the expression of any religious, political, or philosophical views. The basic nature of the crime of harassment is the “thrusting of an offensive and unwanted communication on one who is unable to ignore it.” While the law addresses many areas of human contact – the Colorado Courts of Appeal have repeatedly struck down sections of the law as impermissible limitations on free expression. “Annoy” in this section means “to irritate with a nettling or exasperating effect”. “Alarm” in this section means “to arouse to a sense of danger; to put on the alert; to strike with fear; fill with anxiety as to threaten danger or harm”. “Repeatedly” is a word of such common understanding that its meaning is not vague. It simply means in the context of subsection (1)(h) that the defendant uses insulting, taunting, or challenging language more than one time. How Would You Defend Against A Fraudulent Charge Of Harassment Under 18-9-111? The key defense if you are charged under ANY section of Colorado’s Harassment law is to create reasonable doubt about the INTENT of the Defendant at the time of the communication. Harassment is called a “specific intent” crime – intent is a required element of Colorado’s Harassment statute – 18-9-11. The State must prove that the accused made the communication(s) for the purpose of harassing the victim. It is not enought that the accused used profanity – the use of profanity alone does not constitute an intent to harass. Instead, a communication must disturb, irritate, or bother the victim to be considered to be harassing. Using the “specific intent,” defense – your lawyer will argue at trial that the Defendant did or said something with no intent that the communication was meant to harass the victim – there was no intent to annoy or intimidate the victim – that is – the words used were never designed to provoke a fight for example. The use of an electronic device such as a phone or computer to commit the Colorado crime of harassment was only recently added to the Colorado Harassment law. While the telephone and even email is included under the rubric “cyberbullying” the burgeoning of social networking sites such as Facebook and Twitter have changed the landscape. Was there actually a “communication” that was made? Can it be proven in court. Was there any actual contact or threat made? Was the communication in response to a more serious threat? Did you really “intend” to annoy, harm or alarm anyone? Was the communication “obscene” under the Colorado definition in the statute? Was this communication protected under the Constitution – as an exercise in free speech? There was a solid reason for the communication during inconvenient or unreasonable hours? Was it repeated because the circumstances demanded same? Was there really a violation of the alleged victim’s “reasonable” expectation of privacy? You should be careful to make a responsible choice in selecting a Colorado Criminal Defense Lawyer – and we encourage you to “vet” our firm. Over the last 30 plus years – by focusing ONLY on Colorado criminal law – H. Michael has had the necessary time to commit to the task of constantly updating himself on nearly every area of criminal law, to include Colorado criminal law and procedure and trial and courtroom practice. H. Michael works hard to get his clients the best possible results in and out of the courtroom. He has written, and continues to write, extensively on Colorado criminal law and he hopes this article helps you in some small way – 2016 Colorado – When Does Texting – Calling – Become Harassment? 18-9-111. 2016 Colorado - When Does Texting - Calling - Become Harassment? 18-9-111 - Many of my clients are charged with Harassment under Section 18-9-111 of the Colorado Revised Statutes. There are several ways to be charged with harassment under this law and the law itself is amended often.